Serie A giants AC Milan have today announced the signing of attacking midfielder Lucas Paqueta, the 21-year-old will leave his boyhood club Flamengo to join the Italian giants. According to Sky Sports Italia the fee for the talented young Brazilian is an initial €35m. The Rossoneri have a serious talent on their hands, the youngster made his senior international debut for Brazil in September of last year. 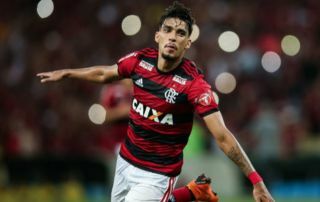 Paqueta is a very versatile attacking midfielder, during his time at Flamengo the youngster has played on the wing, behind the striker and has even been used as a central midfielder. At a first glance the youngster could offer Milan the same kind of versatility that Giacomo Bonaventura has over the last couple of years. Gennaro Gattuso may be on thin ice at the San Siro, the Rossoneri have only won one of their last six games across all competitions. Paqueta’s signing could reignite some fire into the team and push them towards a top four finish this season. According to AC Milan’s official website the youngster has signed a five-year deal that runs until June of 2023. Paqueta certainly has the potential to become a hero at the San Siro.